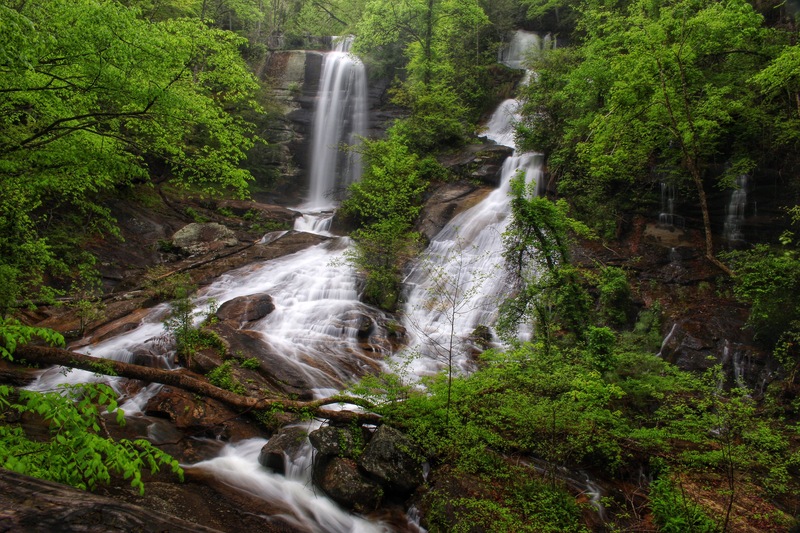 Twin Falls in northern South Carolina is spectacular. As my waterfall list nears the 150 mark now, Twin Falls remain a solid top 10 pick in my favorites list. It’s really a combination of what a great waterfall and scene this is, the ease of access, and a very central location in an area very rich with waterfalls. The walk to this one is short, 10-15 minutes and easy. 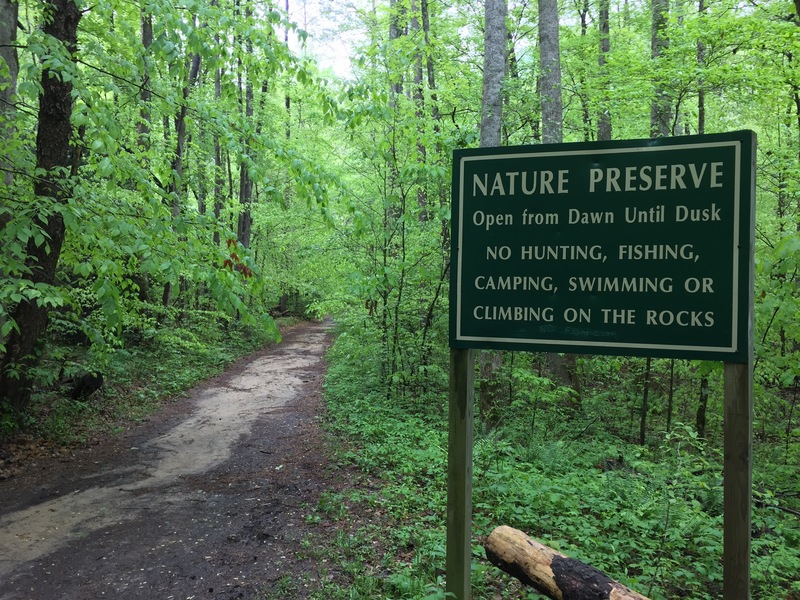 It is located in a nature preserve area. 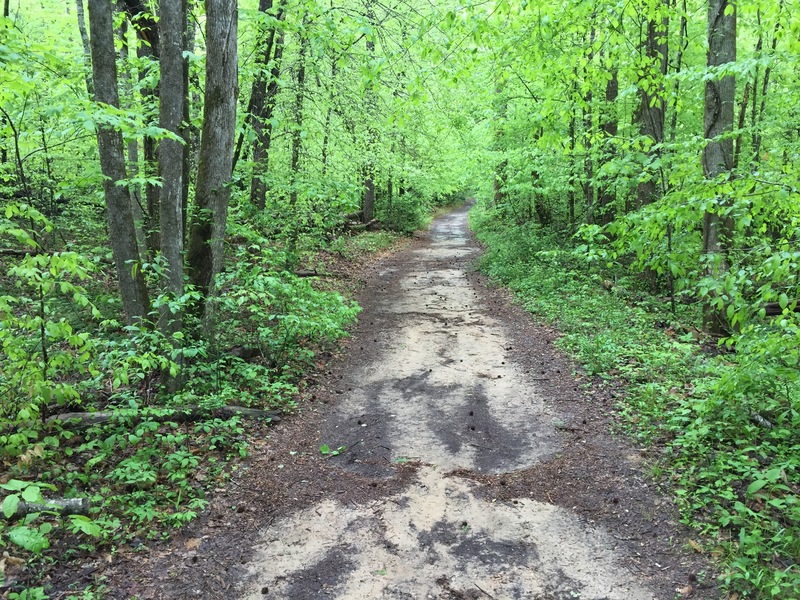 The trail is in excellent shape. To top it off, there is a nice covered shelter once you reach the waterfall that is perfectly located for some great photos. If the weather cooperates, and the rocks are dry, this one is fun to get out on and explore the individual falls closer up. On this day in late April though, it was a gray day with some recent rains and it the rocks were too wet for my feet. The main challenge here is finding the location by car. One of my favorite websites for directions to South Carolina waterfall is www.sctrails.net. 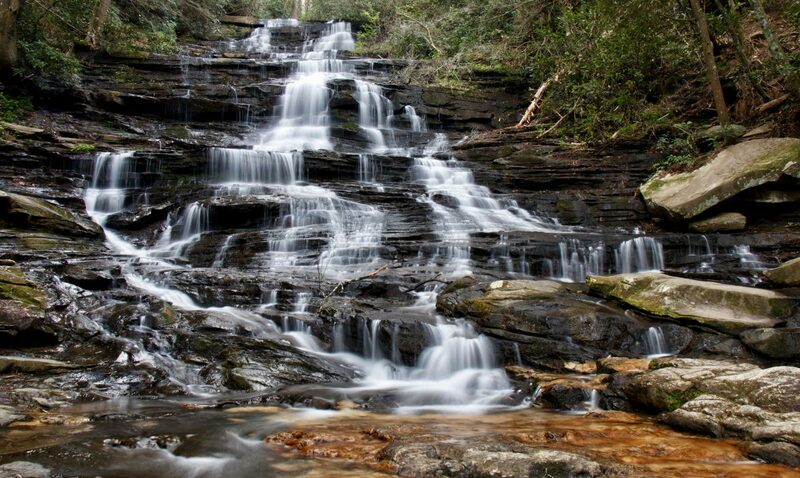 They provide directions to about 25 South Carolina waterfalls and Twin Falls is on their list. From the NC/SC state line on US 178, head about 7 miles south and look for Cleo Chapman Rd. 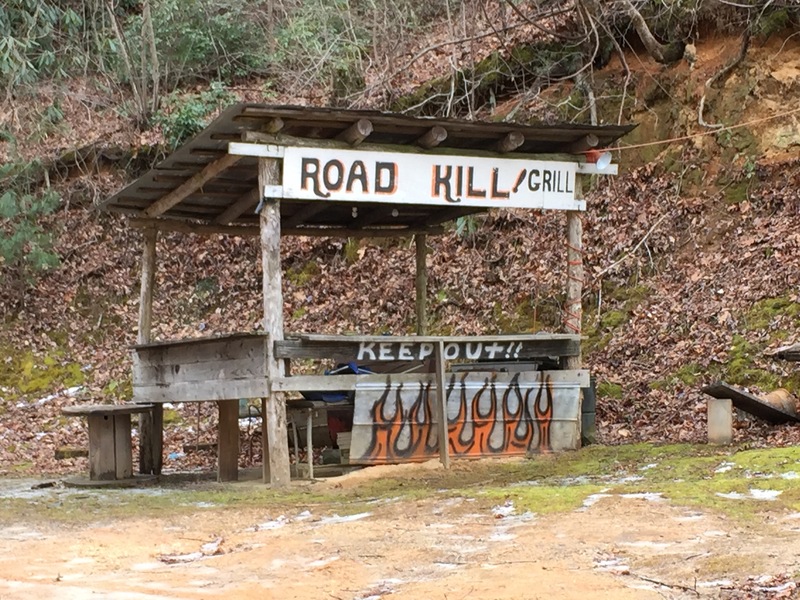 This is marked clearly by Bobs Place in the corner and across the street the “Roadkill Grill”. I have yet to stop in here, but it seems to be a favorite of many waterfall explorers. Make the right turn here and drive several miles down a twisty, curvy road. Once it straightens out at the bottom, look for a large creek crossing of Eastatoe Creek and a fork in the road just beyond that. At the fork, make the right turn onto Eastatoe Community Rd. This is a more narrow road that leads into a residential area. 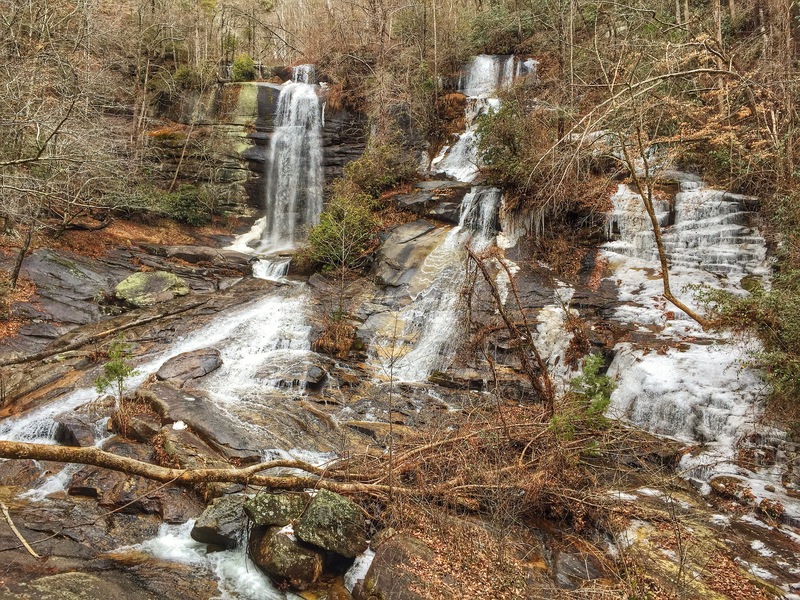 Based on all the no trespassing signs, I would not say that they are not too happy to have tourists driving into their quiet area….But this waterfall belongs to all of us, please drive slow and careful through here. Once you see the sign for “Waterfalls Rd”, make that turn onto an even more narrow road, and follow it through the last remaining houses until it dead ends at the parking area for Twin Falls. As I mentioned earlier, this hike is more of a stroll. As soon as you get loosened up, you will be there. The trail starts off flat and wide and slowly narrows and climbs a tad towards the falls. There will be a waterwheel about halfway there. It was actually turning today due to the recent rains. It was the first time that I had seen it moving. Once at the shelter, enjoy the view!! I will use some photos below to show the difference that 8 weeks makes. The lush, green photos are from late April, the icy ones from late February. Same waterfall, 8 weeks apart. I would say the changes are quite dramatic. As much as I enjoy seeing frozen waterfalls in winter, they just don’t hold a candle to high water flow and deep, rich green color that spring brings! Once you have had enough of Twin Falls…it could take awhile, there are lots of other waterfalls in the area to continue the day. 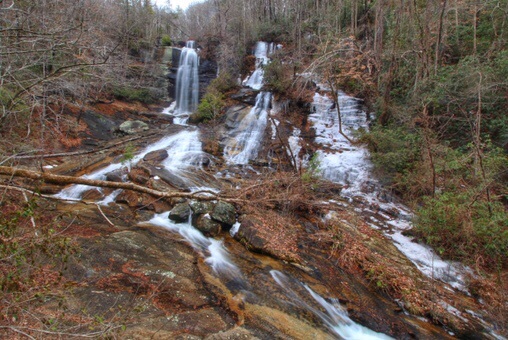 Heading north on US 178, about 3-4 miles is the Foothills Trail Access and the trailhead to Virginia Hawkins Falls. 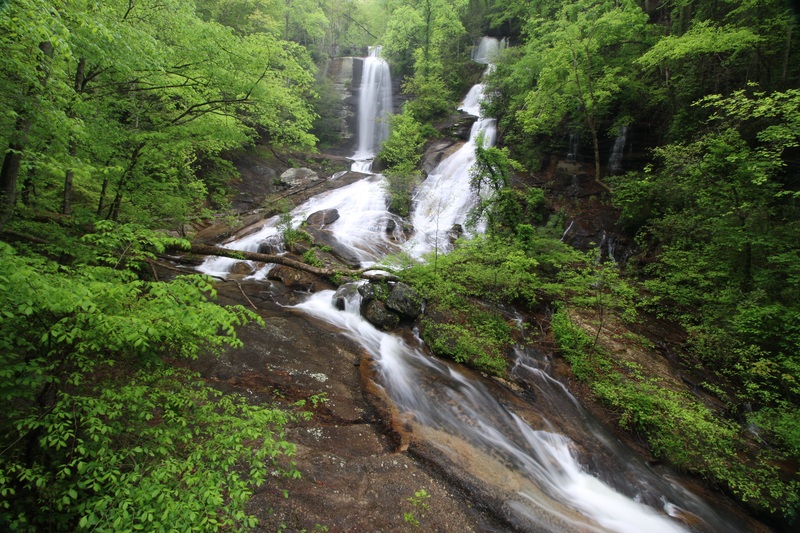 A few more miles up US 178, just in NC, is Eastatoe Falls. There are also many, many others in the are in the upstate SC and in NC close by.